After Taliban militants kidnapped three Sikh men and beheaded one of them in Pakistan in 2010, Muhammad Khurshid Khan, the deputy attorney general of Pakistan, has taken up shining the shoes of worshipers at the Sikh Golden Temple of Amritsar as penance for the acts of terrorism committed in the name of Islam. Sevadari, or service work, is viewed as a devotional act by Hindus, Sikhs and Muslims in South Asia alike, but Khan’s efforts reflect particularly interesting takes on the idea as a form of protest against terrorism. By handling the shoes of worshipers, the deputy attorney general engages in a key act of humbling oneself. Across South Asia and the Middle East, shoes are considered a symbol of filth. To even sit with one’s feet pointing towards another individual is considered rude in many parts of South Asia. 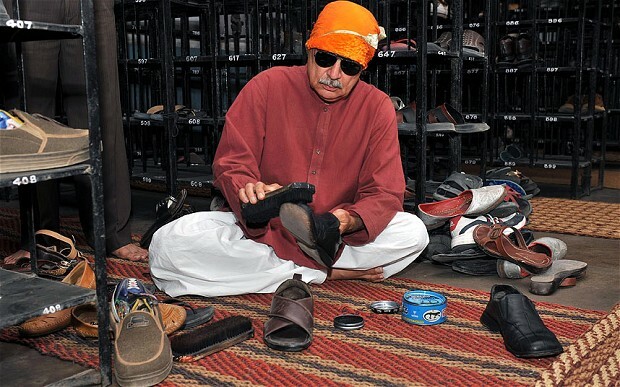 Khan, however, not only handles and cleans these shoes, but also reads the devotional texts of Sikh gurus while at the temple. The efforts of individuals like Muhammad Khurshid Khan challenge popular stereotypes of Muslims (so commonplace in America and Western Europe) as passively accepting violence done in the name of Islam. Indeed, Khan’s actions demonstrate a commitment to Muslim anti-terrorism. Statements produced by Islamic organizations and Muslim leaders to condemn terrorism as well as the efforts of such bodies often go entirely ignored by American media. That this story has yet to be covered by a major American news outlet is illustrative and instructive. One wonders what is at stake in the systematic overlooking of what otherwise seem like remarkably newsworthy events. This entry was posted in Southeast Asian Studies, Summar Shoaib and tagged devotion, Islam, Muslims, Pakistan, penance, Religious Violence, Sikhs. Bookmark the permalink. Fascinating case study. It seems to me that images like this are almost completely incomprehensible to the Western theory of religion as reducible to systems of belief. (That’s a caricature of course, but caricatures walk among us.) Have you ever seen this reported in the Western media?